All I Want For Christmas…How About A Rescue Horse? As I went out to feed my horses this morning, I reflected on how very different my herd looks from just over a couple of years ago – from 5 down to 2. The economy has taken its toll on how many horses we could provide for and we took steps to find homes for several of our horses. We are very Blessed to have found wonderful homes for them. Some horses aren't so lucky though, evidenced by the many equine rescue organizations that are seeing huge increases in the number of rescue horse cases referred to them and the constant barrage of e-mails from my horse friends asking for help finding homes for either their own horses or their friends' horses. If your family happens to find themselves in the market for a horse anytime soon, I would challenge you to first check with one of your local rescue horse organizations for a suitable fit. These horses, through no fault of their own have found themselves homeless and in need of a family to love and care for them. Many of these horses are quite nice, without any lameness issues or other behavioral problems, and some of them with quite remarkable pedigrees. Some have been rescued from abusive situations, but with special handling and retraining by qualified professionals can make wonderful additions to your four-legged family. It has been a goal of mine for quite some time to start offering my services and financial support to Pegasus Project, a horse rescue in East Texas run by a long-time friend of mine and whose horse trainer is our own Dale Kahl who helped get Tex back under saddle and started my own beloved mare Siofhice (BB). I was finally able to pull all that together for 2016 and have been going out regularly to work on some of the horses in need of bodywork. It's been a very rewarding experience for me, and I know the horses enjoy the attention. 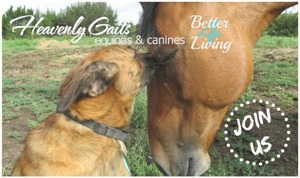 This organization does amazing work and truly makes a difference in the lives of many horses, donkeys and mules. Even if you are not looking to add a horse to your life at this time, you can still help by volunteering your time or making a donation. Most rescue organizations are dependent on volunteers and donations to keep their doors open and get the necessary everyday work done – especially now. This is an excellent opportunity to give in the spirit of the season, and perhaps meet your equine soul mate in the process. It is also a great way for someone that has limited horse experience but is thinking about getting a horse to learn more about what is involved in the care of these animals. Some horse rescues actually require potential adopters to volunteer at the facility for a period of time to gain the necessary handling and care giving skills needed to care for a rescue horse. 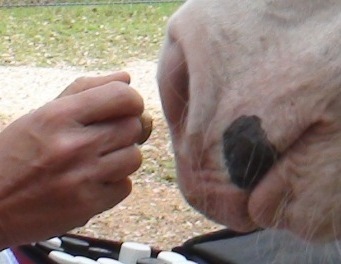 This provides a great learning opportunity in feeding, grooming, veterinary care, hygiene, etc. as well as seeing first hand what happens on the other side of the issue when appropriate care is not provided as it should be. So don't forget your local resources this holiday season and give a life-changing Christmas gift to a horse in need. Yes, horses have Christmas wishes too! They wish for families of their own, kids they can babysit and watch grow, a caring hand placed on their muzzle to let them know everything's okay. Sienna – Featured Rescue Horse Available At The Pegasus Project, Inc. In mid-November 2015, Pegasus was notified of five Quarter Horse mares being neglected in Van Zandt County, Texas. Neighbors were making complaints to law enforcement because the horses had been left unattended for months and were covered in grass burrs. With winter coming on, the witnesses were concerned over the horses' lack of food, forage, and general welfare. On November 19, 2015, Pegasus went to see the horses and found that they were in fact living in unacceptable conditions. They were all a little thin and looked wormy. Their food source was a large pasture overtaken with milkweed. All of their manes and tails were completely tangled with burrs. One had a severe cough and two were experiencing chronic diarrhea. All five had signs of injuries to their lower legs from having been cut due to living in hazardous conditions. The owner claims that all of these mares are registered Quarter Horses that belonged to his deceased father. He claims they are Peppy San Badger bred. Their conformation and appearance seem to support his claim. 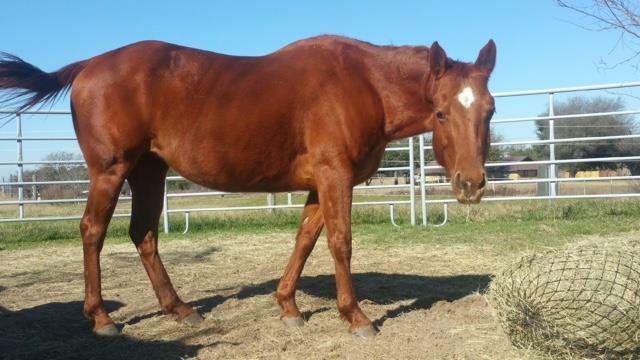 Sienna (who is said to be registered with AQHA as Swooshtika Star) is an 11-year-old sorrel mare. She stands about 14.1 hands and has a quite demeanor. I've had the pleasure of working on Sienna several times now, and she is very sweet and quiet and very well built. For information on adopting Sienna or to find out more about The Pegasus Project horses available for adoption, visit their website at http://www.mypegasusproject.org. May you and your family have a wonderful and Blessed Christmas and Happy New Year! Lisa Carter is a Certified Equine Massage Therapist (CEMT), with multiple certifications from several different equine bodywork schools. 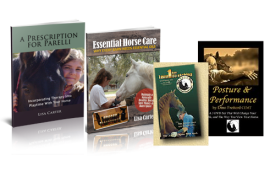 She incorporates her knowledge and experience with Parelli Natural Horsemanship, equine bodywork and as a veterinary technician to provide her clients with the resources they need to make informed decisions for their horses. She encourages and facilitates network building between equine health care professionals, working together to find the best combination of therapies to meet the needs of the "whole horse". Are you ready to get better results with your horse? 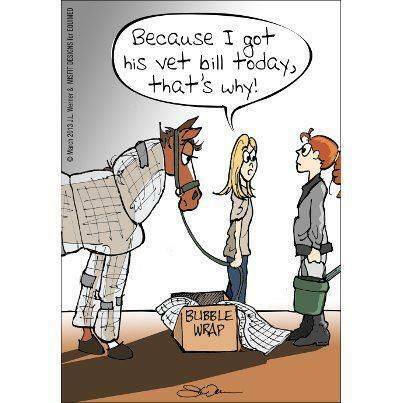 Put your equine health care team to work so you and your horse can be doing what you were meant to. Click here to get started! Previous post: Does My Horse Really Need Stretching?